Tom Cruise as VP would also freak me out. 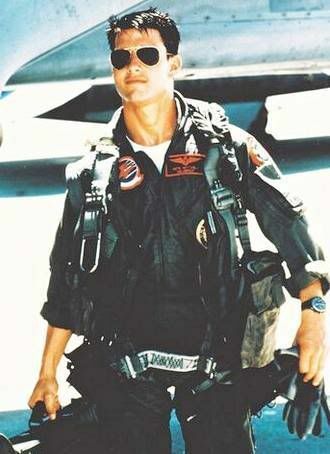 I wish I thought of Tom when I think Maverick. I think of the hideous blue Ford Grandma drove with its tacky sparkly "Ford" sticker on the window and the tan interior door handle that she must have found in a junk yard because it didn't match the others. Even as a young child I was mortified to have to drive around in this thing! I used to think that. I fear I am forever scarred by the McCain-Palin campaign now. Maybe I need to watch Top Gun ten time to reset my Maverick memories. my neighbors named their kid maverick. I must have repeated the word Maverick at least 25 times last night. It was a sad night for my husband. We should have a drinking game while watching Palin speeches. Every time she says "Maverick" we all take a drink. Hello Smashed City! So, does that make Palin "Goose?" loved when he was hot. You're everyone's problem. That's because every time you go up in the air, you're unsafe. I don't like you because you're dangerous. Of course! Then Palin would be Goose, right? much preferred. VERY much so.